We expect that the range of potential applications of DLT (Blockchain) will grow exponentially over time. This could have far-reaching implications for our stakeholders, and affect the way these entities operate and the structure of the market in which they offer their services. —Australian Securities and Investments Commission (ASIC), document: INFO 219, 2018. Blockchain technologies are having a profound impact on industries, economies, and societies around the world, revolutionising data security, efficiency, banking and payments, and start-up capital raising. In 2018 to date, USD$18 billion has been raised to finance more than 700 new blockchain enabled businesses. 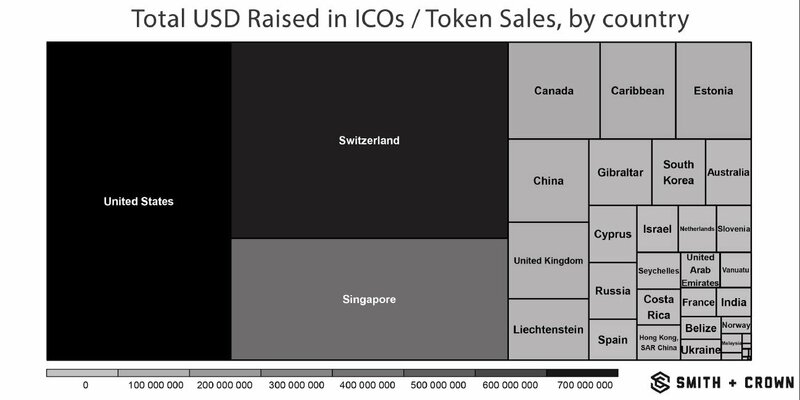 Of these, 51% of blockchain business models raised funds in the US, Switzerland, and Singapore (figure 1). Australia has been relatively slow, with approximately 15 blockchain technology start-ups raising capital, though ASIC and other government institutions believe blockchain enabled entities in Australia will grow rapidly in the near future (ASIC 2018). 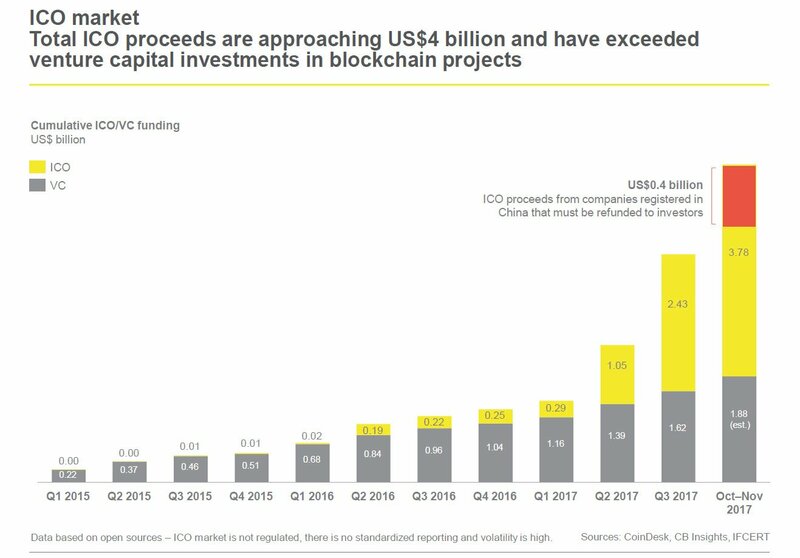 It is now estimated that more startup capital is raised through blockchain enabled ICOs globally than traditional venture capital (VC) methods (figure 2), highlighting the popularity and rapid diffusion of blockchain. Although the opportunities and economic benefits of blockchain are significant, policies and frameworks guiding the implementation and mitigation of risks of new business models employing this technology remain woefully underdeveloped. A significant body of research suggests that regulatory, compliance, and best practice uncertainty stifles economic innovation (e.g., Blind, Petersen, and Riillo 2017; Jones 2015). 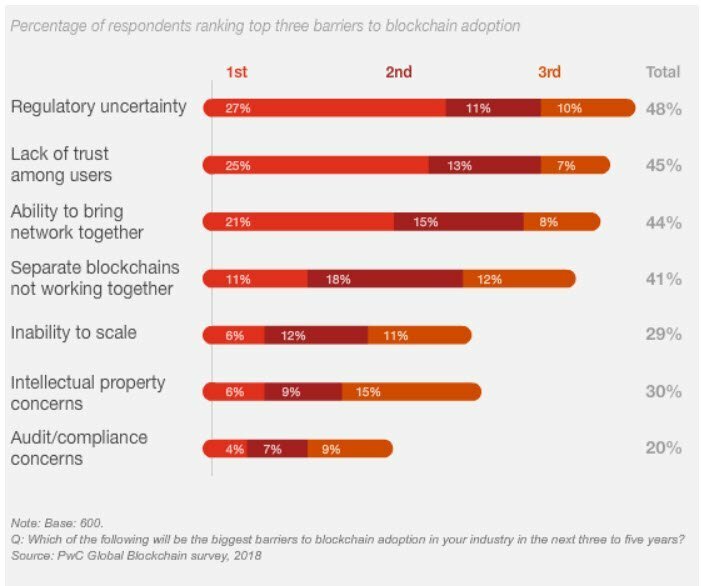 Consistent with this research, a recent study by PricewaterhouseCoopers found that in addition to audit and compliance concerns, regulatory uncertainty is currently the biggest barrier to blockchain adoption (figure 3). Some evidence suggests innovative blockchain start-ups in Australia are relocating offshore to avoid this uncertainty (and potential retrospective violations), highlighting the urgent need of policies and frameworks to guide blockchain compliance and implementation in Australia. There is currently no clear pathway for investors, entrepreneurs, and regulators to mitigate blockchain risk, and there are insufficient frameworks for guiding the successful implementation of blockchain enabled business models and ICO fundraising. Given the potential economic benefits associated with the emergence of blockchain, and the rapid diffusion of blockchain throughout multiple industries and financial systems, there is an urgent need to address this deficiency. A blockchain is a distributed decentralised database (ledger) of records that may include digital events such as code execution, or simple transactions. Each transaction or digital event is stored in a ‘block’, that is connected to other blocks in a chain formation. Modifying the data in any block breaks the chain – thus acting as a secure mechanism to ensure each transaction or digital event in a blockchain is unable to be edited. Verification of transactions recorded onto a blockchain is handled through a process of consensus, whereby participants in the system agree that any transaction is valid before it is recorded. Thus, the two benefits of using blockchain over a traditional database include: trust-less verification of records through consensus, and immutability of data (data recorded is unable to be modified by hackers). The application of blockchain in society may be broken down into two broad categories: Financial and non-financial. Examples of financial applications include: speeding up and simplifying cross-border payments, increasing the accuracy and settlement times for share trading, automating transactions through ‘smart contracts’, securing and verifying identity management protocols. Some examples of non-financial applications include: verification of ownership, supply chain traceability, energy and resource consumption incentivisation, voting verification, data integrity and security, Internet of Things (IoT) communication protocol standardisation and security, and hardware applications such as smartphones. An ICO is a means of crowdfunded financing for start-up companies. In an ICO, a specific quantity of tokens (aka cryptocurrency, alt coins) is offered for sale to investors in exchange for legal tender fiat currencies or other cryptocurrencies such as bitcoin or Ethereum (Schuettel, 2017). This process establishes a direct relationship between start-ups and investors. Tokens are often sold as utility within the internal ecosystem of the ICO, in this case called coins, while in other cases they are sold as a right of ownership or royalties to a project but not necessarily with some voting rights. Accordingly, in addition to raising capital for a start-up, ICOs are also used to kick-start the sale of a service where investors are given opportunity to buy coins at a discount, given the supply and demand once released to market. Investors could become users of the service. In comparison to traditional IPOs, ICOs create new roles for their investors. The role of investors in traditional IPOs is to provide a fund and offer them opportunities to vote on major corporate issues. With the current ICO design, investors are incentivized to support the Ecosystem of the new technology at different stages including funding, advertisement and usage after it launches. 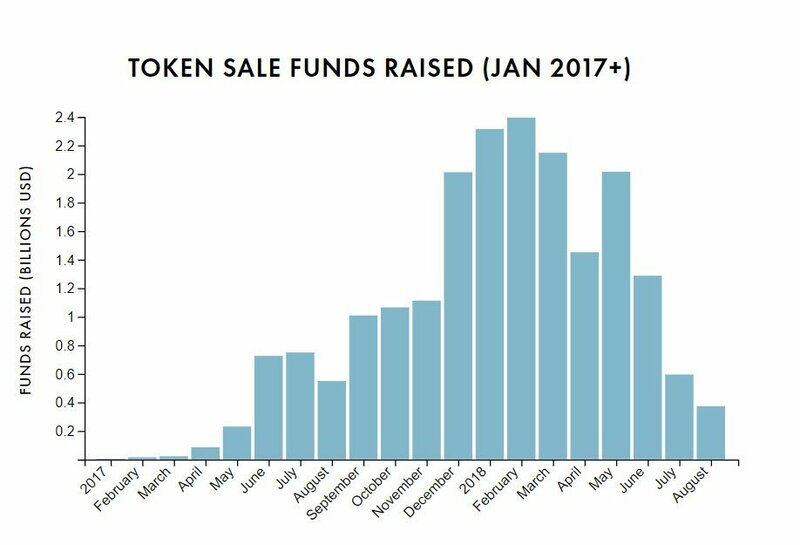 Total funds raised by ICO since January 2017 is significant (Figure 4), and recent research by Ernst and Young suggests that cumulative ICO funding now surpasses traditional early stage venture capital (VC) funding (figure 3) suggesting trends towards fundraising through ICOs cannot be ignored. There are several specific issues that will need to be addressed to maximise the economic benefits of blockchain in Australia, and reduce stakeholder risk. Countries around the world have adopted a variety of strategies to deal with blockchain, from extremely tight restrictions (e.g., China) to adaptive and sandboxing type models where rapidly changing and experimental approaches keep up with the pace of rapidly changing technology environment (e.g., Singapore, Switzerland, Malta). Some countries have taken advantage of blockchain regulatory uncertainty (e.g., Canada, Singapore, the Isle of Man, Gibraltar, Malta), proactively enticing world entrepreneurs. Switzerland is thought to be at the forefront of blockchain growth model facilitation. We suggest that Australia is unfortunately lagging far behind. An ICO involves selling of ‘tokens’ (utility tokens) to raise money. These tokens may be bought and sold on public exchanges, though they differ from stocks in that they do not usually come with cash flow or voting rights. When a blockchain becomes active, some tokens act like currencies (e.g., bitcoin), whereas others act like staking or betting mechanisms, or coupons that are redeemable for goods and services offered by the company. Current legislation does not specifically account for ICOs, tokens, or cryptocurrencies, and under strict interpretations of the functions of tokens, they may be legally considered securities or derivatives (the Corporations Act 2001). Specifically, if tokens are issued in respect of a platform where purchasers are speculating on the token’s value, then they can be considered a derivative under current Australian legislation. In which case, the ICO process in Australia could be considered a managed investment scheme, which would suggest ICOs in Australia are illegal, since distributing derivatives and securities (Managed Investment Schemes) by an unlicensed operator is illegal. In September 2017, ASIC noted: ‘ICO issuers may frame the entitlements received by contributors as a receipt of a purchased service. However, if the value of the digital coins acquired is affected by the pooling of funds from contributors or use of those funds under the arrangement, then the ICO is likely to fall within the requirements relating to MISs (Managed Investment Schemes)”. Currently legislation does not fit the economic realities of ICOs, and as a result there is evidence of Australian start-ups relocating offshore to avoid uncertainty in local markets. Blockchain models are disruptive for a number of reasons, one being that they have the potential to increase the liquidity of assets. Shares of stock in private companies are illiquid – they cannot be easily traded. Tokens from an ICO however are highly liquid, and able to be traded almost instantly on exchanges. There are more market participants, greater trade volume, and smaller spreads, and as a result the price when selling is usually higher (‘illiquidity discount’). Blockchain models facilitate trading on secondary markets through tokenisation, and therefore open possibilities for traditionally illiquid assets to be tokenised, increasing liquidity. Houses for example could benefit from mortgage tokenisation, whereby a real estate owner purchases a house though tokenisation, and makes payments to token holders instead of a bank like a traditional mortgage. Commercial real estate investments could be made on a smaller scale, bought and sold by trading tokens on cryptocurrency exchanges. Evidence suggests tokenisation of assets is already a reality , and research strongly suggests the next wave of blockchain diffusion is likely to encroach on asset tokenisation. Without proper guidance there are multi-faceted regulatory issues with this blockchain variant diffusing through traditional industries, including serious security issues and potentially unenforceable ownership claims. There are tax issues with blockchain enabled business models, particularly with regards to ICOs, and money transfer legislation. One notable example is the so-called “Netflix Tax” which requires sellers of digital goods to collect and remit GST. In theory, an token issuer (an ICO) should be required to collect GST when the sale of the token occurs or when the token is redeemed, though the collection and enforcement mechanism for how this should occur has not be developed. Part of the difficulty with regards to collecting tax on token sales in Australia is related to who owns a token at any given time, given almost all token ownership is largely anonymous, particularly when overseas exchanges are used to buy and sell. An important feature of blockchain enabled business models is the operation of ‘smart contracts’. These are automated computer routines that execute commands such as payments and other terms of a contract. Problems arise when smart contracts are combined with Artificial Intelligence (AI). If a machine makes a contract, is it enforceable, and who is responsible for losses or damages caused by machine errors? Because of the distributed nature of blockchain, it is not possible to “switch-off” the blockchain when needed. There does not currently exist any clear direction to indicate who is responsible if losses or damages are caused from a smart contract programmed by a machine. Complicating matters are the data providers that translate real world data that executes the smart contract (known as “oracles”). Oracles run “off-chain” (not part of the verifiable blockchain system), and are therefore subject to misinformation feeds to smart contracts. Oracles contain software that may setup smart contracts, though assignment of responsibility to an oracle is complex and under current legislation potentially unenforceable. We foresee an urgent need as part of the AUSBLOCK framework to address this issue through a formal technology arrangement system whereby expected qualities, attributes, features and even behaviours are accounted for, including securities, guarantees and insurance. Blockchain technology is maturing rapidly and we foresee in the near future smart contracts feature more prominently in commerce. The issue is that autonomous software entities can come into existence at any time, though they cannot just be “switched off”. Currently, the ICO process does not require any formal regulatory approval or protocols. Most projects are backed by whitepapers which is essentially a prospectus that outlines the technical aspects of the product, the problems it intends to solve and how it is going to address them, a description of the team, and a description of the token generation and distribution strategy. It is at once a pitch deck, a business plan, a marketing plan, and a technical manual. This process of crowdfunding eliminates the cost of regulatory compliance and intermediaries, while increases risk for investors. Blockchain technology is having a profound impact on global markets, equity fundraising practices, and asset tokenisation. Diffusion is rapid, and there is an urgent need to harness the opportunities and economic benefits of blockchain, and mitigate potential risks without stifling innovation and development. Regulatory uncertainty inhibits innovation, but there is a trade-off between protecting public interests versus stifling innovation. Global regulation of blockchain varies substantially, both by country and by use-case. Areas that need urgent attention include: smart contract law, asset tokenisation, and guidance on what needs regulating, and what should not be regulated. The nature of whether or not tokens are securities or derivatives remains unclear. Until this is resolved, development will be stifled. Regulatory uncertainty can be more harmful than the regulation. ASIC (2018), “Info 219,” https://www.asic.gov.au/regulatory-resources/digital-transformation/evaluating-distributed-ledger-technology/. Blind, Knut, Sören S. Petersen, and Cesare A. F. Riillo (2017), “The Impact of Standards and Regulation on Innovation in Uncertain Markets,” Research Policy, 46 (1), 249-64. Jones, Huw D. (2015), “Regulatory Uncertainty over Genome Editing,” Nature Plants, 1, 14011.